Constructed for personal use in a part time plastics engraving enterprise, this nicely designed machine is a picture of simplicity and innovation. Notice that the vertical (Z) stage and a horizontal stage (X) are commercially purchased assemblies. Y axis translation is accomplished by moving the work bed under the rigidly mounted X and Z stages. 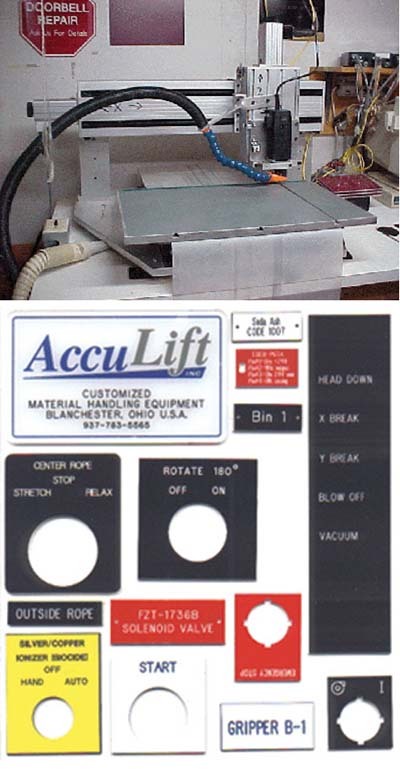 The work bed is mounted on pre-loaded ball slides, and moved by means of a lead screw and an anti-backlash follower. A mylar curtain protects these components from debris. The plastic material to be engraved is mounted to the work bed via dual adhesive tape, and peeled off when finished. Photographs submitted by C. Iker.